I already voiced my discontent at seeing Glissa Sunseeker twisted into an agent of Phyrexia, now I have to behold a twisted reflection of Darksteel Colossus? This guy was the iconic beater for years on end, his reprinting in M10 allowing him to stand shoulder-to-shoulder with Progenitus in standard Polymorph decks. And now, for a measly one mana more, he has infect. He now kills in one shot! One unblocked attack is all it takes to completely end an opponent. His indestructibility make his nigh-impossible to stop once he hits the board, and he's as good as the original at thwarting mill decks. This is absolutely insane, and it boggles my mind that this saw print. Who says Vintage never changes? As if Tinker and Mana Vault decks weren't scary fast enough already, now they have the option of playing a Colossus that kills in one hit rather than two. Ouch. In other situations, this card is just as exciting if not quite as scary. Existing infect decks probably won't need a creature that costs 12, but Master Transmuter and Sharuum the Hegemon could always use new friends. He may not have required too much thought to design, but Blightsteel Colossus is sure to be adopted by both competitive and casual decks. Welcome back readers and today's jaw dropping card of the day is Blightsteel Colossus a powerful infect throwback to Darksteel Colossus. This card can kill players in one hit its big and powerful. In standard this is a good target for a new Shape Anew deck archetype combine it with a Darksteel Axe and bam early win. In extended and eternal Mass Polymorph and other decks that sneak it into play could definitely use this card along with the hideaway lands or cards like show and tell and sneak attack, you will definitely not be hardcasing it outside of a dedicated ramp deck. In casual and multiplayer the plethora of ways to cheat this into play and its sheer power level make it a nightmare for opponents, being indestructible and an anti milling card is just icing on the phyrexian cake. In limited if you get it out it shrugs off removal and is a win condition also being a chase mythic rare is gravy. Overall an elegant and powerful corruption of an iconic Mirrodin creature that will see play in every format. 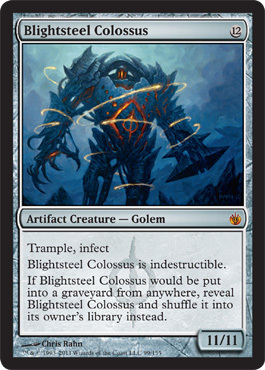 Today's card of the day is Blightsteel Colossus which is an 11/11 for twelve mana with Trample, Infect, indestructible, and returns to your library if sent to the graveyard. This can win the game with a single attack if not blocked by a creature with at least two toughness, but takes some sort of combo to bring into play relatively early on. Being both a creature and an artifact gives it several options for acceleration and it is likely to see at least some play in tournaments and definitely in the casual and multiplayer formats. For Limited this is again a bit difficult to get into play, but once it is on the battlefield you will likely win the game. While you may not be able to play it, the option of passing it is quite risky as well. Drafting it first and watching for any form of acceleration or tricks to play it directly are your best options. In Sealed it depends on your pool, but the deck can be designed to support such a large creature if necessary. Today’s Card of the Day is the Blightsteel Colossus. The name Blightsteel implies that he is an artifact and that he works for Phyrexia. Colossus implies this guy is friggin’ huge. And that would be an understatement. It takes twelve mana to get the Colossus on the board, but you will get an 11/11. He has a laundry list of abilities from there. Trample, Infect, Indestructible, Whenever he would be put into a graveyard from anywhere shuffle him back in. Literally it is Darksteel Colossus with the plague. Twelve mana is kind of hard to come by in most formats without resorting to some trickery. However, what player has ever played without having some tricks? I think this guys is going to be very easily exploited in standard, and heavy abused in vintage. I think standard decks are going to drool over the prospect of getting their hands on this guy. The heaviest use of him I feel will be in Green Eldrazi decks. Summoning Trap this guy out, and you opponent will likely concede. The prospect of him being pumped and attacking could spell defeat if they don’t have something up their sleeve. Not to mention that Eldrazi spawns will help with that pesky twelve mana problem. But, me being me, feel that perhaps the easiest application for this guy is simply to fling him at your opponent. Make sure of course they can’t pay for that counterspell, and just throw him in your opponent’s face. Eleven poison counters should end the game right there. I am a vintage guy at heart, and the possibilities are much more fun for this guy there. Imagine if you will a big multiplayer game. You are running a red deck, using Eldrazi spawns as some mana ecceleration, or even Mana Flares. You played Pandemonium last turn, whenever a creature enters the battlefield, that creature’s controller may have it deal damage equal to it’s power to target creature or player. So you drop Blightsteel Colossus, target a player, 11 poison counters, then, you fling it, 11 more poison counters, there’s 2 players down, how many more are left, cause before Flinging, you could Soul’s Fire, 11 more poison counters. Not bad for a days work. So while the Blightsteel Colossus is very similar to Darksteel Colossus, perhaps the biggest difference is that Blightsteel Colossus can actually take out the Darksteel Colossus.